Welcome to this year's 3rd issue of DistroWatch Weekly! Software, particularly open source software, tends to go through phases of development. When new distributions or applications arrive on the scene, they usually grow new features, taking on more tasks and more roles over time. Eventually, the software becomes heavy enough that it is harder to maintain or use. At that time, the developers usually streamline the software or minimal alternatives will appear. Those alternatives usually grow new features and take on more tasks until the cycle begins again. This week we look at some examples of projects taking on new features and others looking to streamline. In our News section we cover Sabayon extending support to ARM-based computers and Slackware introducing support for PulseAudio. We also talk about Linux gaining support for virtualized 3-D video acceleration while the Fedora project considers dropping 32-bit support for its Server edition. In our Feature Story this week we talk about a minimal distribution called Kwort and discuss the project's back-to-basics approach. Then, in our Questions and Answers column, we talk about Linux operating systems that do not rely on GNU software. Also, in this issue, we share the torrents we are seeding via our Torrent Corner and provide a list of the distributions released last week. In our Opinion Poll we ask who among our readers use (or have used) the Tor network service. We wish you all a fantastic week and happy reading! I do not think I have ever installed the Kwort distribution before. It's one of those projects I think about trying when a new release comes out, but something else has always come along to steal away my attention. Last month, during a quiet period, I decided to download the latest release of Kwort, version 4.3, and give it a try. According to the project's website, "Kwort is a modern and fast Linux distribution that combines powerful and useful applications in order to create a simple system for advanced users who find a strong and effective desktop. Kwort is based on CRUX, so it's robust, clean and easy to extend." The project's website had the following to say about Kwort 4.3: "As always we remain fast, stable, and simple and now we have grown up a little to include a lot of Linux firmwares available for tons of devices. As usual, everything has been built cleanly and from scratch." The distribution is available in a single edition and is designed to run on 64-bit x86 computers exclusively. The installation media is relatively small, just 470MB in size. Booting from the project's installation media brings up a text console where we are automatically signed in as the root user. Instructions for installing the distribution are displayed on the screen and we can cause these instructions to be shown again at any time in the future by running the "helpinstall" command or by pressing CTRL-D. The installation instructions let us know that we will need to do a bit of manual work to get a fresh copy of Kwort up and running. At times the instructions are sparse and I recommend reading the on-line copy of the installation guide as it fills in some of the blanks. Kwort does not have a system installer and so we find ourselves using command line utilities to partition the hard drive, format disk partitions and mount the areas of the disk where we plan to install the distribution. We then run a command called "pkgsinstall" which copies the base operating system onto our waiting hard drive. We then need to manually edit our fstab file and the system's configuration file, rc.conf, to make sure it has our correct keyboard layout and time zone. Another command sets the root password. Next, we need to decide which boot loader to install (LILO or GRUB), along with supporting packages, and run commands to install the boot loader and configure it. Again, the installation steps are a bit vague here and I recommend visiting the on-line documentation to see examples of how best to proceed. Assuming we successfully get a boot loader installed we can then reboot the computer and begin exploring Kwort. By default, we find ourselves navigating a text console interface. Kwort ships with the usual collection of command line tools, manual pages, a copy of the GNU Compiler Collection and version 4.1.13 of the Linux kernel. Kwort offers users the SysV init software and, at first glance, a very minimal experience. However, we can run the "startx" command from the text console to gain access to the Openbox window manager. Openbox is presented with a task switcher and system tray at the bottom of the screen. We can right-click on an empty region of the desktop to bring up an application menu. Looking through the application menu we find a short list of programs. The Chrome web browser is included along with the Transmission bittorrent client and the Lftp simple FTP client. The Leafpad text editor is included along with a calculator, the Audacious audio player and MPlayer. Kwort includes multimedia codecs for playing our audio and video files. The GpicView image viewer is included along with the Midnight Commander file manager. What I found strange, and frustrating, was that several programs were listed in the application menu which were not installed and trying to run them would result in an error saying the file was not available. LibreOffice, the PCManFM file manager, the Openbox configuration application and the GTK configuration program are all listed in the menu, but do not exist on the system. Further complicating things, I could not find these applications in the distribution's software repositories, and I will come back to my experiences with Kwort's package manager shortly. The default installation of Kwort is fairly minimal. The distribution used just 20MB of RAM when sitting idle at the text console and took up approximately 1.4GB of hard dive space. Later, I found running Kwort's default graphical environment, Openbox, caused the operating system to use just 45MB of RAM. I tried running Kwort on a physical desktop machine and in a VirtualBox virtual machine. Kwort worked fairly well on the desktop, though it was a touch slow to boot. In the virtual environment, the distribution would run smoothly, but would not take advantage of my display's full resolution. I wanted to install VirtualBox's guest modules to gain better integration, but Oracle's official modules could not recognize Kwort's environment and the distribution appears to not have any VirtualBox packages in its repositories. This left me with a somewhat restricted experience when running Kwort in a virtual machine. On the subject of hardware, at first when I started using Kwort I thought audio was not working. After a little poking around I discovered audio was, technically, working but the sound mixer available on the desktop was of limited use because the underlying ALSA mixer was turned down low. A trip to the command line allowed me to use alsamixer to raise the background volume and then fine-tune audio output using the desktop control. Managing software on Kwort is accomplished using the distribution's kpkg command line package manager. At first I was a little confused by the utility because whatever command I passed it to (update, upgrade, install or search) would cause kpkg to immediately return without providing any output. With a little looking through the documentation, I realized there is a command for installing repositories and, until a repository is installed, kpkg does not do anything. The default repository file can be downloaded from the front page of the distribution's website. Once the package database has been downloaded and installed, we can fetch repository data. Then kpkg refused to work until I had manually created the directories under /var it would need to download and store package data. At this point I found the repositories were fairly small. I did not get an exact package count, but I was unable to find much of anything in Kwort's repositories. I was unable to find LibreOffice, OpenOffice, VLC, desktop environments, AbiWord or a dozen other common packages. I did find a copy of the nmap security tool, but once it was installed nmap failed to run due to missing dependencies. Sadly, I was unable to even find a screen shot utility, which is why this review is so lacking in imagery. At the end of 2015, I reviewed Arch Linux. At the time I commented that Arch's minimal and sometimes cryptic nature might not make it practical in many situations, but there are things I respect about Arch. Specifically, Arch keeps its users on the cutting edge of technology and, perhaps more importantly, the Arch Linux project has extensive, well written documentation. Running Kwort was a little like running Arch Linux, but with older packages and virtually no documentation. An experienced user may be able to get Kwort installed by following the on-line guide, but beyond that point there does not appear to be much we can do with Kwort. I was able to get a graphical user interface running, edit text files, play multimedia files and browse the web. But there was no image editing, no screen shot tools, no productivity suite and not even a working graphical file manager. This made running Kwort a very limiting experience and the lack of integration with VirtualBox did not help matters. My experience with the distribution was, at times, made more frustrating when I had to do things like drop to a command line to fix audio output or download the default software repository data. I'm not sure why repository data is treated as an add-on, it's not as though Kwort is desperately trying to save space since the project ships with the Chrome web browser. I think my biggest frustration though, after having tried Kwort, is I suspect I am missing out on something, but simply do not know what because of the sparse documentation. There could be a great community repository of software or more useful tools or wonderful reasons for the design decisions made. However, I am not aware of them. For a distribution to be useful it needs, in my opinion, to either present its features in an easy to explore way (like Ubuntu) or it needs to have great documentation (like Arch Linux). Kwort, though it has merit in its lightweight nature, is not easy to explore and has very little documentation. Two factors I think will keep most users away from this minimal distribution. The Sabayon distribution is expanding its architecture support and has released testing images for ARM devices, including Raspberry Pi mini computers. The new images are accompanied by ARM packages that are built from Gentoo's flexible ports collection. "The approach to the ARM(hfp) support will be different from the previous attempt, we are not going to support kernels for each different board we intend to build images, instead we will release images with vendor-kernel to avoid incompatibilities and unexpected features. This is what almost every distribution does for tons of reasons, among them I want just to underline that in those years we have seen a lot of new ARM boards out of there and we can't just support all of them, maintaining a kernel branch for each one would result in low QA (since our dev-team is small) and probably in hard decisions to be made when support will be dropped from vendors (think also on how short a board's lifespan is, and how projects die quickly). In that way, we can still provide support also for legacy devices as well." More information on the new development images for ARM can be found in this blog post. Another project that is rolling out new features is Slackware Linux. The world's oldest surviving Linux distribution released a beta version last week and the change log contained a surprise: Slackware will be shipping with the PulseAudio sound software. "After upgrading to BlueZ 5 recently, everything seemed to be working great, but then it was pointed out that Bluetooth audio was no longer working. The reason was that the newer BlueZ branch had dropped ALSA support and now required PulseAudio. So with some trepidation, we began investigating adding PulseAudio to Slackware. Going back to BlueZ 4 wasn't an option with various dependent projects either having dropped support for it, or considering doing so. After several iterations here refining the foundation packages and recompiling and tweaking other packages to use PulseAudio, it's working well and you'll likely not notice much of a change." The PulseAudio software had a rocky start several years ago when it was introduced into more cutting edge projects, but has since been widely adopted by most Linux distributions. While Sabayon and Slackware expand their list of features, the Fedora project is looking to streamline their offerings for the upcoming launch of Fedora 24. The list of potential changes for Fedora 24's Server edition includes the possible removal of support for 32-bit machines. "The Fedora Server SIG has determined that we no longer feel that i686 install media is critical to our success. Since delivering and maintaining each install medium requires significant effort, the Server SIG has decided to stop shipping i686 media. This includes both the Server Install DVD and the Server Network Install ISO." It is hoped that dropping support for 32-bit servers will reduce the work required by the quality assurance team. While we do not usually cover specific features in new Linux kernel releases, last week distro-hoppers and gamers received some good news. Starting with Linux 4.4, the kernel will support accelerated 3-D rendering in virtual machines. This means it should be possible to run desktop environments and video games that require 3-D hardware acceleration inside a virtual machine with almost no performance loss. The Kernel Newbies website explains, "virtio-gpu is a driver for virtualization guests that allows it to use the host's graphics card efficiently. In this release, it allows the virtualization guest to use the capabilities of the host GPU to accelerate 3-D rendering. In practice, this means that a virtualized Linux guest can run a OpenGL game while using the GPU acceleration capabilities of the host." There is a video on YouTube demonstrating GNOME Shell running in a virtual machine making use of hardware acceleration. Seeking-a-penguin-without-a-gnu asks: The name GNU/Linux indicates a distribution ships with GNU software and the Linux kernel. Are there any Linux distributions which are not also GNU distributions? DistroWatch answers: There are operating systems that use the Linux kernel without GNU, or at least without many GNU components. The Android operating system and ports of Android, such as Android-x86, use the Linux kernel while providing a very different userland from GNU/Linux. Android is a rather focused market though and people looking for general purpose Linux distributions will probably want to look at something like Alpine or Void Linux. According to Alpine's website, the distribution uses the musl C library and BusyBox instead of GNU software: "Alpine Linux is built around musl libc and BusyBox. This makes it smaller and more resource efficient than traditional GNU/Linux distributions." It has been a while since I last used Void Linux, so I am not sure how much GNU software the distribution does or does not use, but the project's website, mentions Void uses musl rather than GNU's C library: "Many packages are compiled against musl, an alternative libc implementation, in addition to glibc." Sometimes developers go in the other direction and use GNU without Linux. For example, the Debian project maintains a couple of ports which use GNU userland software with kernels other than Linux. The Hurd port and the GNU/kFreeBSD port are interesting examples of GNU operating systems that run without the Linux kernel. 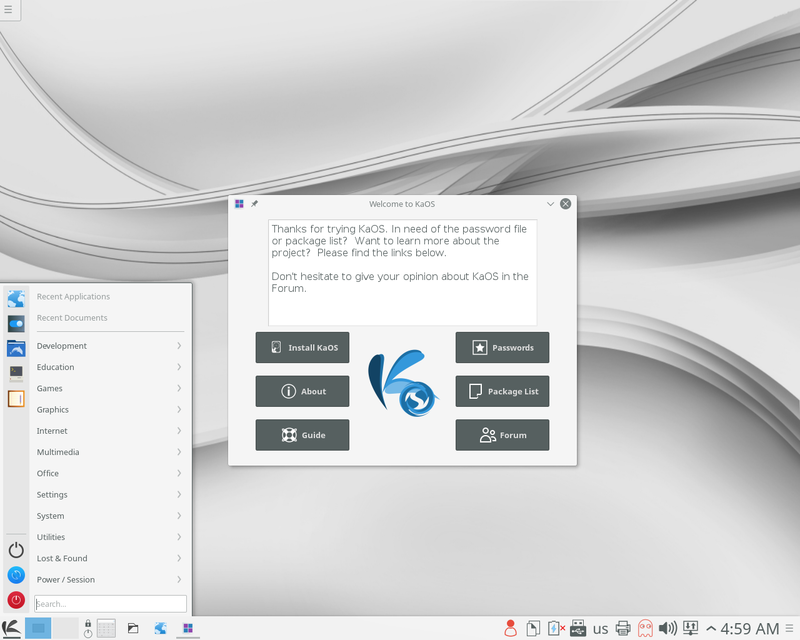 Anke Boersma has announced the release of KaOS 2016.01, a new version of the project's desktop Linux distribution featuring KDE's Plasma 5 desktop: "It is with great pleasure to present to you a first KaOS ISO image for 2016. As always with this rolling distribution, you will find the very latest packages for the Plasma Desktop; this includes Frameworks 5.18.0, Plasma 5.5.3 and KDE Applications 15.12.1. Plasma 5.5 has brought new features in Widget Explorer, expanded options in applications launchers, new widgets including Color Picker and Disk Quota, restored support for legacy system tray icons, default font has moved to Noto and Desktop Tweaks for different handling of widgets, plus option to disable the desktop toolbox. Among the new applications in 15.12 are Spectacle, the new screenshot capture program. Many more are now fully ported to Frameworks 5 and are part of the stable tar release in their frameworks version." Continue to the release announcement for further details and screenshots. Tiny Core Linux 7.0 "piCore"
Tor is free software and an open network that helps its users defend against traffic analysis. The Tor software essentially bounces a person's Internet traffic around a number of nodes to help disguise where network connections originated. This can help keep Tor users somewhat anonymous when communicating on-line. Some Linux distributions, including Tails, ship with Tor enabled by default to assist users in maintaining their privacy while on-line. Tor is not just useful for anonymous communication, it can also help people bypass censorship in order to read websites in other countries or to get around other forms of regional filtering. This week we would like to know how many of our readers have experimented with the Tor software. Was it an effective tool for you? Please leave us your thoughts on Tor in the comments section. Often times it is useful to be able to compare package versions between two distributions. Perhaps to see if one distribution is staying closer to the bleeding edge of software development, or to see which distributions have adopted a new feature such as UEFI support. It can also be helpful to compare packages between two versions of the same distribution. This can show how quickly a distribution moves forward over time. This week we are pleased to unveil a new feature which will allow visitors to DistroWatch to compare package versions from two separate distribution releases. This enables us to see whether CentOS or Debian Stable ships with older packages. Or we can compare Fedora's development branch to Arch Linux to see which project is offering fresher packages. We can also see how far ahead Debian Unstable is compared to Debian's Testing repositories. This feature is in its early stages and we are hoping to get feedback on the package comparison functionality to better adjust it to our readers' needs. Please send us an e-mail with your suggestions and put "Compare Packages" in the subject line. Remix OS. Remix OS is an operating system based on the Android-x86 project. It is designed to run on desktop and laptop computers while providing a familiar interface for users of the Android operating system. DuZeru. DuZeru is a beginner friendly Linux distribution for Portuguese speakers. The DuZeru distribution is based on Debian and Ubuntu. 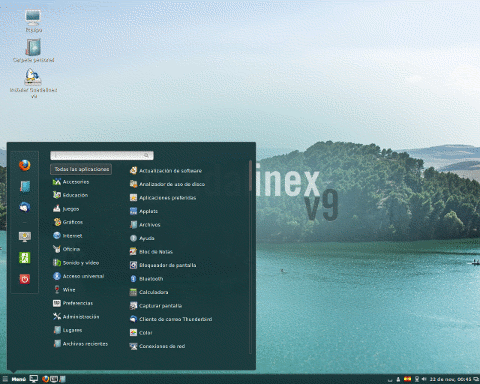 Guadalinex is a Linux distribution based on Ubuntu and developed by the government of Andalucía (Junta de Andalucía) in Spain.